I had originally meant to just go to DC for this cake, but it turns out that my brother happened to be graduating on the same weekend… so it turned into a marathon trip! The itinerary? AZ–red.eye–> DC 12 hrs –night.road.trip–> AL done and done… where somewhere within the 12 hours in DC, a 3 tiered wedding cake was to be created and delivered. Ah, much planning had to go into this trip… but it turned out ok :). Here goes! 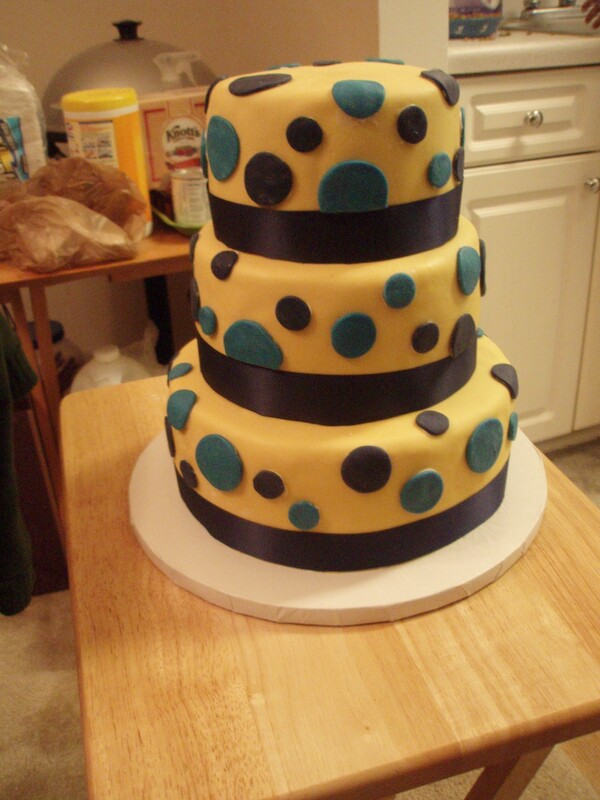 This is a wedding cake for Joanne, a three tier, chocolate/vanilla, yellow and blue polka dot cake. Let the photo tour begin! 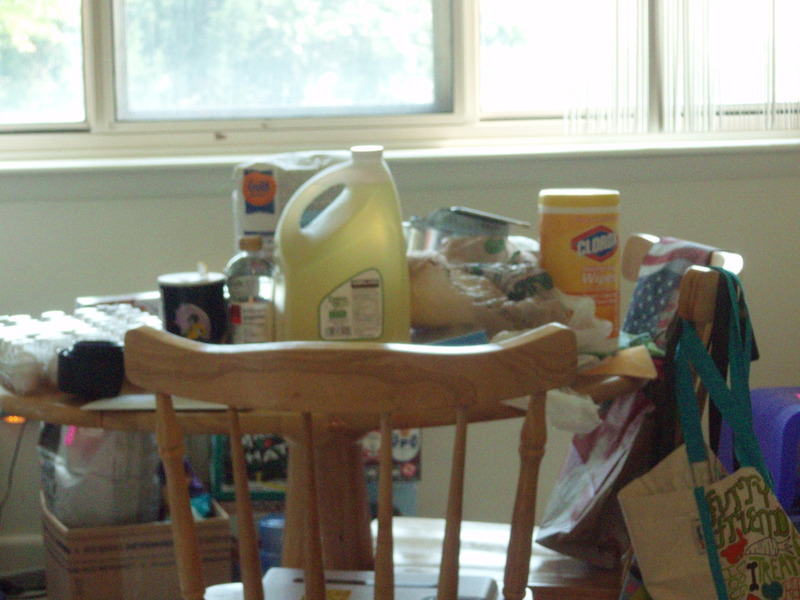 11:00 AM Friday morning— Getting acquainted with a new kitchen and new surroundings. 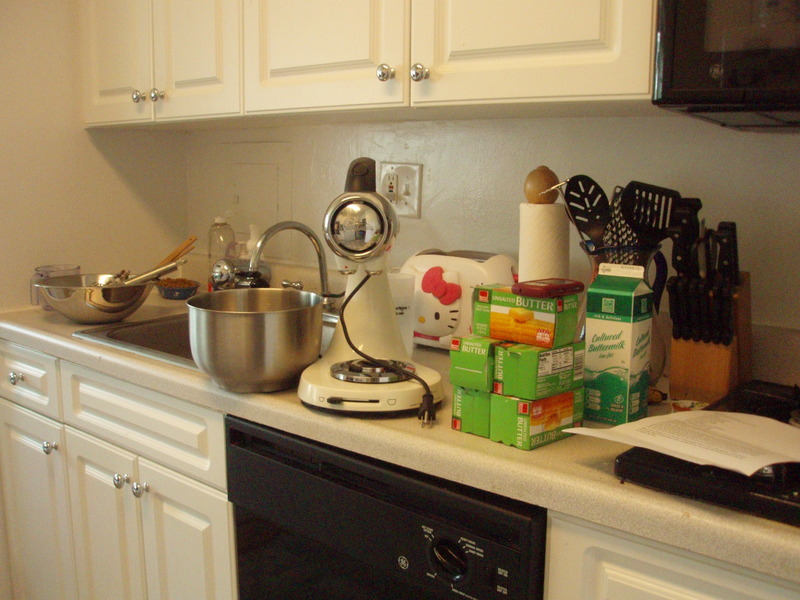 My sister Mel and Pezz (her fiancee) were gracious enough to let me use their kitchen. Check out the Hello Kitty toaster. And this sweet Sunbeam mixer. At first I was worried because I only ever use my Kitchenaid, but this turned out to be way better! 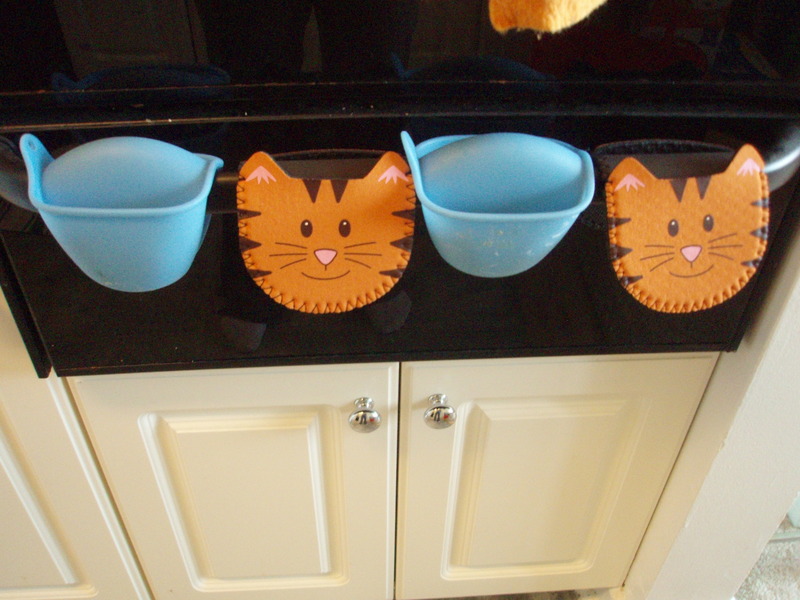 Right below the oven were some cute oven mitts. Catching onto the theme yet? 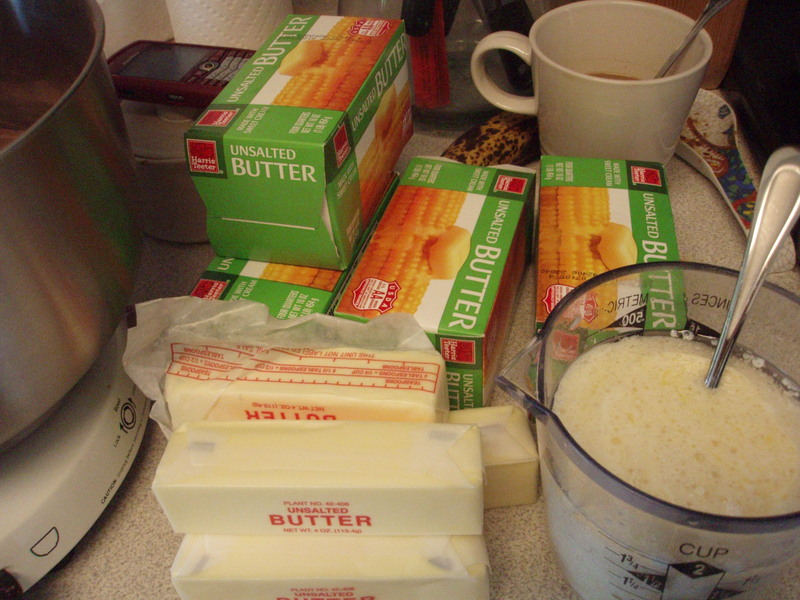 The spread of ingredients: Mel dutifully shopped for me so everything would be ready when I arrived. Check this out. 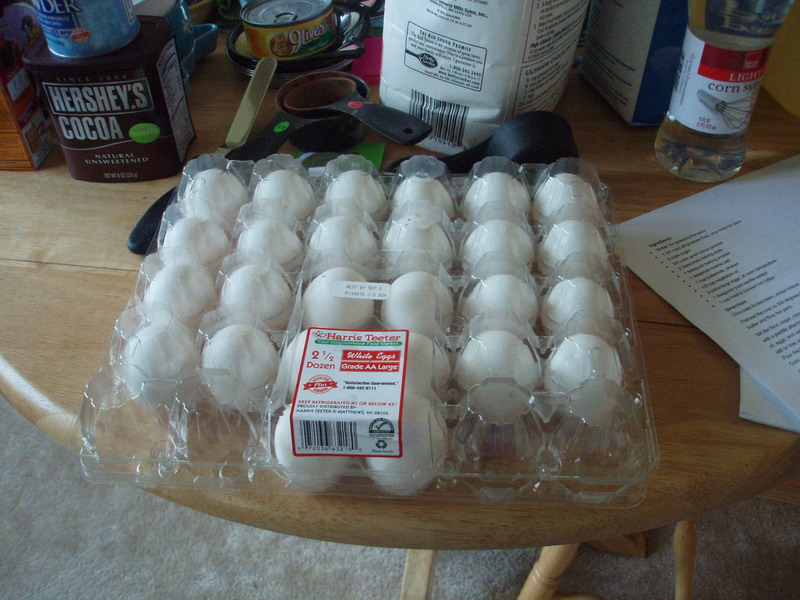 Harris Teeter sells 2.5 dozen eggs in one carton… I used… almost all of them. Note the cup of joe in the background. I was running on maybe 4 hours of sleep on two different planes. It was necessary. 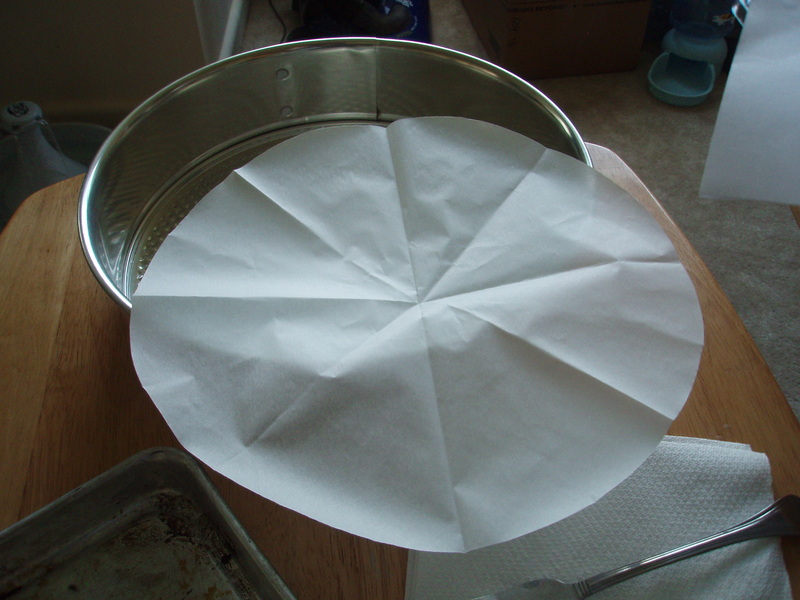 I started prepping the pans with parchment, when I notices that this is quite possibly the most perfect parchment circle I’ve ever cut. I took the time to take a photo of this accomplishment. It’s the little victories! 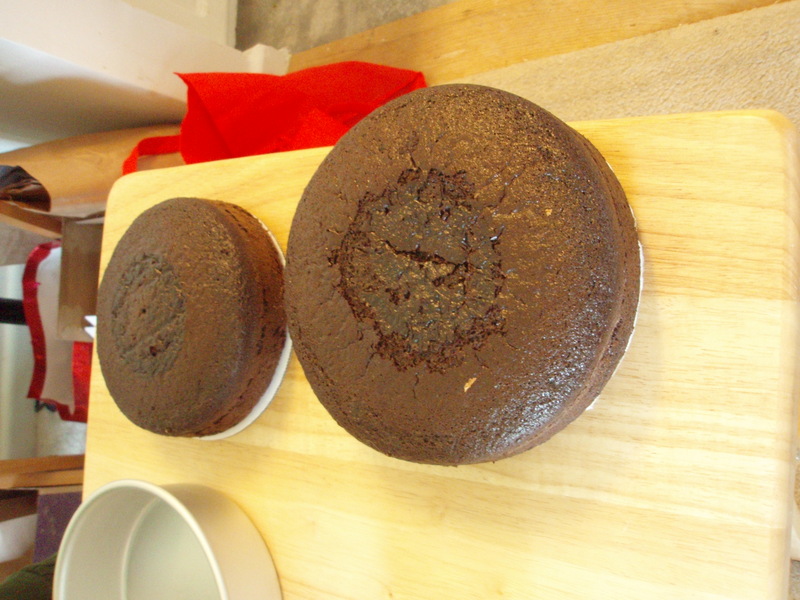 1:00 PM–The first cakes come out of the oven. 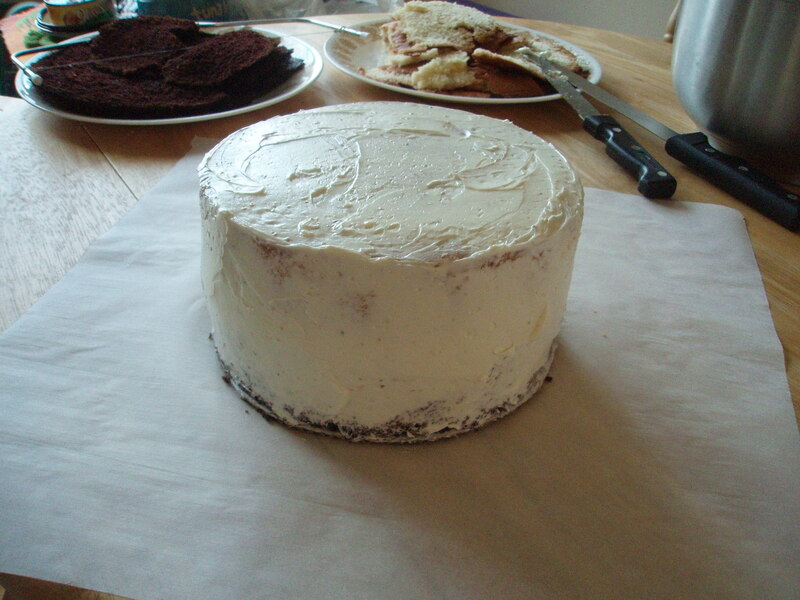 Chocolate layer! 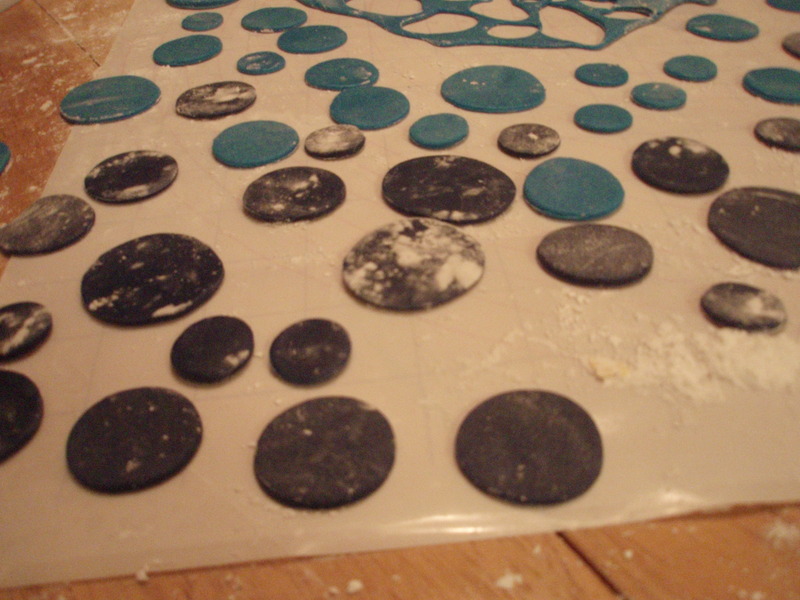 7:30-10:00 PM covering the cakes in yellow fondant, and creating many polka dots of two different shades of blue. 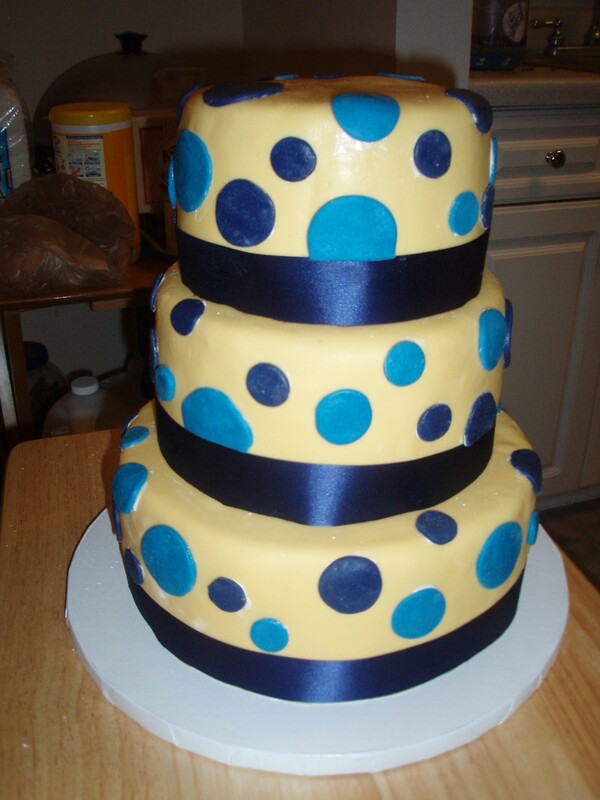 I also added some blue ribbon to match the darker shade of polka dot, per the bride’s request. Here’s a photo with flash… it sort of changes the colors but I thought it would be an interesting juxtaposition. 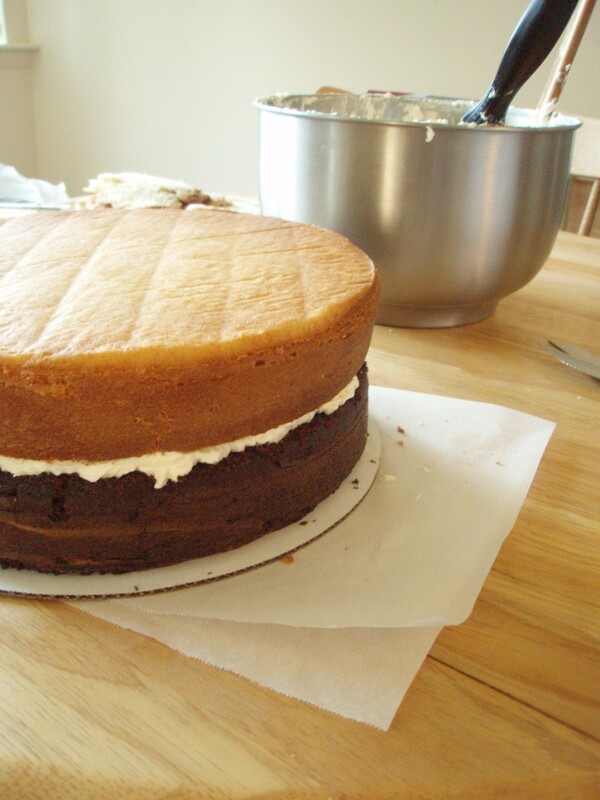 It was a rather unconventional wedding cake, but Joanne loved it! She said it matched her colors perfectly and was exactly what she was looking for. 10:15 PM So Pezz drove me and Mel very carefully to Herndon in a freezing car. We pumped up the A/C so that the cake would be in a good traveling environment. 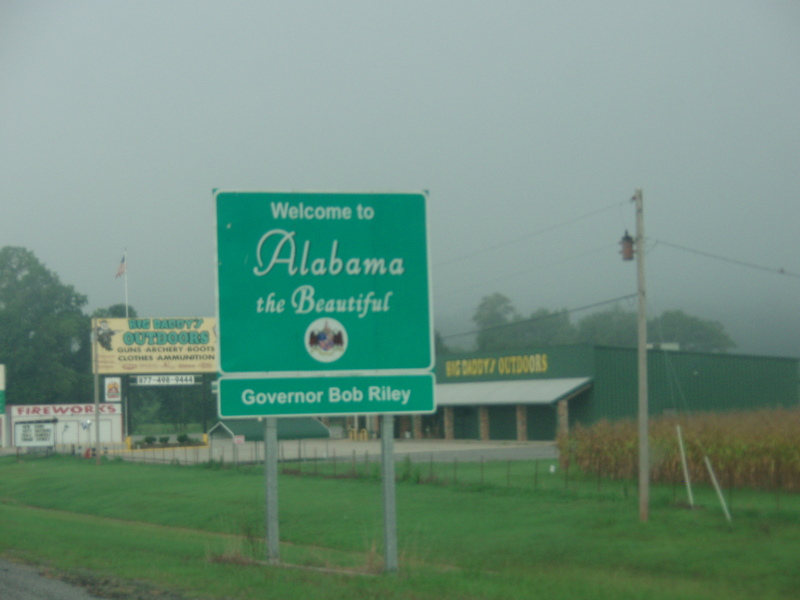 The plan was to drop off the cake and then start on the 14 hour drive to Sweet Home AL. 11:15 PM The cake was dropped off and we headed out! 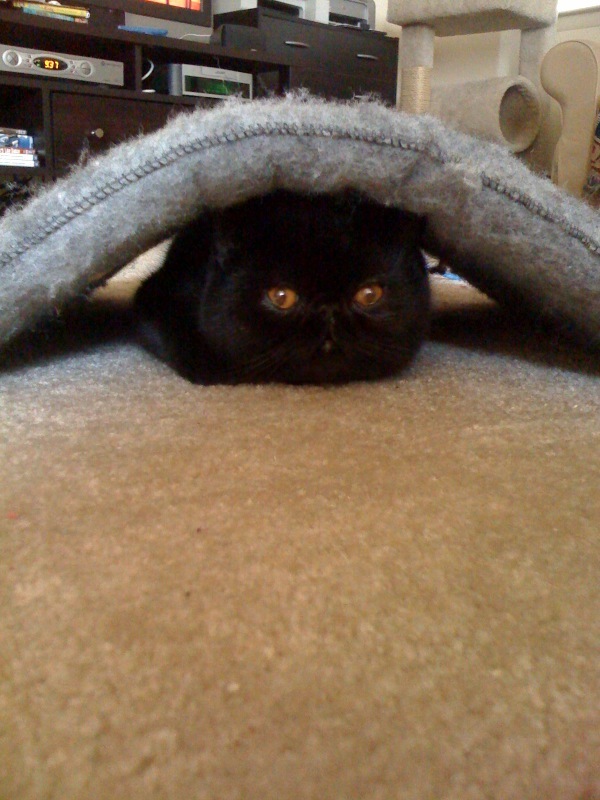 12:00 AM- 5:00 AM… ZZZZZzzzzzzzz…. I took a photo of this because we had to stop for a bathroom break. Welcome HoooMMMeeee!!!! 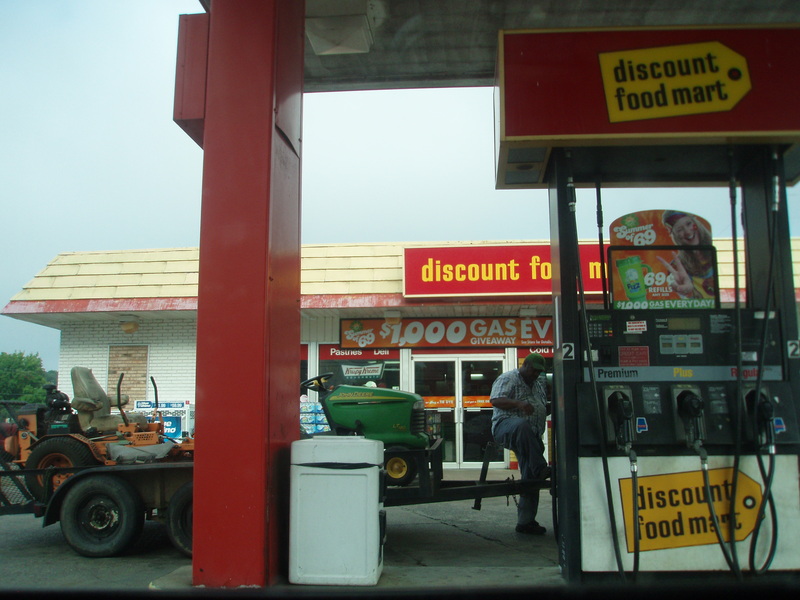 7:40 AM: Hello Discount Food Mart and Mr. John Deere.